By participating in Aunt Rene's Mystery Quilt, I ended up with a cute little baby quilt. There is still another step to complete the mystery quilt, but since I'm doing my own thing, step 4 is my stopping point. Here it is as a flimsy, lying on a round table with the corners falling over... it will be 40" x 40" square when completed. I enjoyed following Doreen's instructions to make this mystery quilt, although if you read my blog, you know I didn't follow the instructions to the T! But I love the results... I've always wanted to make a zigzag quilt! Thank you, Doreen! The backing will be a mottled pink flannel seen on the left in the picture above. My Dad was 1 of 8,960 men who served with the Eighth Air Force B-17, 303rd Bombardment Group, known as "Hell's Angels." This group flew a record of 364 combat missions, and were stationed at Molesworth, England, from 1942-1945. My Dad served his country proudly, and loved to tell stories of his days in England. He passed away in 1993, at the age of 72. Wishing all of you and your families a Happy Memorial Day. I hope it is a day of remembrance, as well as celebration for you! Maybe "breaking the rules" is too harsh... more like, "doing it my way." Yeah. I like that better! BUT, if you want to see Doreen's TRUE pattern, go here! It's a real beauty! At the end of the post, Doreen has links to other blogs that are participating in this sew-along. It is so fun to see how the REAL pattern looks in the various fabrics chosen by the other quilters! As you can see, I decided to omit the row of geese blocks that form a flag banner row. Instead, by repeating rows of the four patch block, I've ended up with a charming zigzag pattern and I like it!!! My plan is add a narrow border, and then a wide border, using fabric from the same line as the blocks. (Baskets of Flowers by Mary Engelbreit for Moda). The finished size will be 40" x 40", perfect for a baby quilt! The NICU (Neonatal Intensive Care Unit) at the hospital where I work is always in need of baby quilts. (A quilt is given to every baby who spends time in the NICU... it lays on the baby's little isolette, and goes home with the baby upon discharge). I'll share pictures once it's completed. Thank you Doreen, for hosting this very fun sew along!!! Can you guess which pattern from the book this is??? 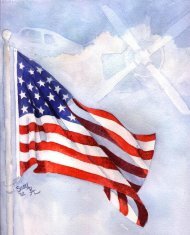 A blessed three day weekend is upon us... happy Memorial Day to all of you and your families! And if time allows, spend some with a needle and thread! I love it when one project counts towards more than one objective... my finished Sweet Pea Doll Quilt is a completion, and fulfills my participation in FNSI (sponsored by Heidi), and Kathleen Tracy's May 2013, Small Quilt Talk Monthly Doll Quilt. My finished mini measures 16" x 16", smaller than Kathleen's pattern because I used fabric from a jelly roll for my outside border. (The jelly roll fabrics were end bolt strips, put together by a delightful quilt shop in Brainard, Minnesota... a crafty way to mix, match, and sell, leftover fabric!) After sewing the binding on, I hurried outside to catch the last of the daylight for my pictures. I had fun with the machine quilting, using for the first time, my new Pfaff Quilt Expression 4.2. It was a joy... but I'm still learning where and how all those buttons work! When I came back indoors I noticed a framed cross stitched sampler that I made back in 1990... the colors in the sampler are similar to the mini quilt... I just may have to figure a way to display them together! Tell me how you spent your day... did cutting, piecing, or quilting fabric play a role? Kathleen Tracy's 2013 Quilt a Month Challenge selection for May is Sweet Pea Doll Quilt. You can find the free pattern here. For information about Kathleen's Monthly Quilt Challenges, visit her blog here. I spent last evening pulling fabrics, cutting, and piecing the center of the block together. My plan is to finish it this weekend. When completed this cute mini will be 18" x 18". The fabrics I'm using are from my stash, except for the 5 fat quarters in the picture. I picked these up on the same visit to my LQS when I purchased my new Pfaff. (Yes, I find it difficult to leave a quilt shop without a few fat quarters for my stash... don't you?) It never fails... I'm constantly drawn to the same fabric designers... Judie Rothermel, Paula Barnes, Edita Sitar, Barbara Brackman, and Jo Morton to name a few. Can't get enough of them! So far so good with the Pfaff Expression 4.2! Love the thread snips, bright LED lights, large sewing space, bobbin thread sensor, the large foot control, and so much more! I don't think I've discovered nearly every feature as of yet! I'm wishing all of you a happy weekend... hopefully you will be able to spend some of it with a needle and thread! Enjoy!!! ...that's me, once again. Yes I can read instructions, but I don't always follow them! This is the case with a sew along I recently joined. 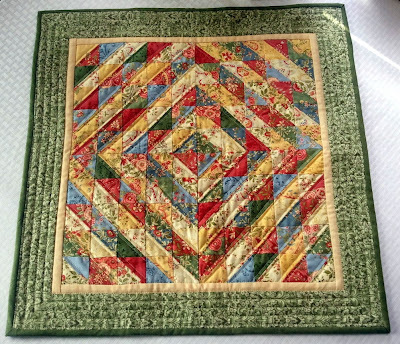 Doreen at Aunt Reen's Place is hosting free monthly fast and easy mystery quilt alongs using precuts. The quilt for May is Easy Summer Breeze, and uses one layer cake and a contrasting fabric. I signed on, knowing exactly the layer cake I was going to use... it's been in my fabric closet for at least 5 years! And I knew I had plenty of fabric from the same line to use as my contrasting fabric. Turns out I must have dipped into that layer cake for another project... oh yes... I remember now. Christmas presents, 3 years ago... I made oven mitts and hot plates for the females in my family. (Except me, because one has to cook to have a need for oven mitts and hot plates!) Aha!!! I have a charm pack in the same fabric line! It's settled! My Easy Summer Breeze won't be a 72" x 84" quilt! It will be a table topper, a wall hanging, or two baby quilts! I love to read in my spare time... whatever that is! I'm really into my latest find... it's not really a book... it's an owner's manual! After months and months of research, and oodles of encouragement from my quilting gal pals that currently sew with Pfaff machines, I took the plunge and visited my favorite local quilt shop to purchase the sewing machine that will carry me into retirement, and beyond! I brought my new baby home last Thursday evening and due to a very busy weekend I haven't had a chance to play with it very much. I'm looking forward to the quieter approaching weekend. I just may hibernate, and hang a sign on my door that says "Gone Sewing!" ... a no sew weekend for me. In fact I haven't been in my sewing room since last weekend. That wasn't the plan, but it's the plain truth! However, I do have something to show you. My big sis doesn't have a blog, but she has been sewing along with Darlene and I, and many of you, in the Simply Charming Every Other Month Sew Along. This is her mini quilt for April. Sis may not have a blog but she has an Etsy shop, and she informed me that this cute little mini sold the day after she posted it. Way to go Sis!!! She use a charm pack of Portugal for Moda, by April Cornwell. This past week I was more in reading mode than sewing mode in the evening hours after work. It's a problem... if I'm engrossed in a book, NOTHING else gets done! And that was the case with Me Before You, a novel by JoJo Moyes. LOVED IT!!! I will definitely be seeking other books by this author! Although we had unseasonable weather last Wednesday, Thursday, Friday, and into Saturday, (lots of rain, of few inches of snow, windy, and cold), my daughter and I were determined to make our annual visit on Saturday to a local greenhouse to purchase our pretties for container gardening. (We like to go the weekend before Mothers Day to avoid the crowds). My prized purchases will have to spend evenings in my garage the next couple of days... I'm hoping for more realistic May weather next weekend so the planting can begin! The local weathermen have shared words of encouragement, but we all know they've been wrong before! Keeping my fingers crossed! Just wondering... if you're not in sewing mode, what do you do?? ?